"Thank you, yes it arrived just as you said on Monday. I took it to the Veterinary office on Wednesday and our beloved Mugsy is now home safely with us. Thank you very much for the nice card enclosed in the box. 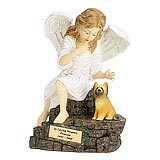 I also appreciated the brochure cause I have friend that it looking for an urn for her dog and gave that to her." 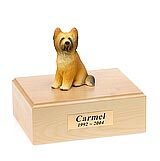 All available Briard dog urns and memorials will be displayed with the figurine on the Briard urn you select and in the appropriate size.